The 2018 World Cup is coming soon, so celebrate football fever with NexGen Gaming’s quirky mascot, Foxin. With 5 reels, 3 rows and 25 paylines, and the cheerful fox who has appeared in other NextGen games, Foxin Wins Football Fever celebrates the Beautiful Game in all its glory. Several features increase players’ chances of winning, and the slick, cartoon-style illustrations make this a fun gaming experience that doesn’t take itself too seriously. It’s a great homage the world’s most popular sport and gives players a great time - much like watching a game of football. Place your deposit and spin today to start playing! 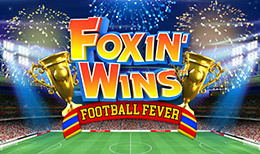 Foxin Wins Football Fever has some excellent defining features, including striking illustrations and the SuperBet feature, along with others that make this a great game released in the run up to a major world sporting event. The SuperBet feature allows you to place an additional bet, and this increases players’ chances of winning. It increases the chance of landing the fox pups symbol and on additional reels, which turns other symbols wild and can increase winnings. There is also a Random Bonus feature that can occur at any time. To know if this feature has activated, look out for the Leprechaun Shakedown and Fox Funds symbols, which give you cash prizes. If you land enough of the pot of gold scatters, you earn free spins and multipliers. The more pots you land, the more you get. There are the usual lower value symbols in this game - A, J, K, Q and 10 - and higher value symbols depict Foxin and his friends. The referee symbol is the Wild that replaces all of the other visible symbols except the scatter. These symbols are particularly well illustrated and make for a pleasing gameplay experience that’s topical and plenty of fun. The extra features in Foxin Wins Football Fever make this a particularly great game, especially with the surprising Random Bet feature. The ability to increase your wager in order to improve your chance of winning is also something certainly worth exploring. If you like football and the World Cup, this is a great way to celebrate the spirit of the game and the tournament season. With many ways to win and the fantastic artwork in this new release from NextGen Gaming, this is a fun game incorporating the developer’s previous theming. So go football mad and have a kickabout with Foxin Wins Football Fever.